Rice is a traditional and important crop for Italy, which ranks first among producing nations in Europe. With the varieties it has bred, SIS now holds a share equal to 24% the surface area used for rice growing in Italy, and this is steadily on the rise in Mediterranean areas. SIS's research work, which has set it apart in Italy, has led to the development of new varieties that have become hugely successful in the space of just a few years. SIS also pays particular attention to the absence of red grains and seed health. The ambitious challenge SIS tackles with its genetic research work is to promptly and efficiently respond to rapid changes in demand from consumers who are increasingly discerning, and from the industry that wants products for special uses that are increasingly diversified. SIS's technical work: Over the last 5 years, SIS has carried out important work for the screening of varieties in all rice-growing provinces, organising "SIS field days" in different rice-growing areas to see and compare varieties directly in the field. SIS rice varieties, with their different growth cycles, can be used for both conventional sowing (20 April), and late sowing (15-20 May). No intolerance to common weed killers used in rice-growing has been reported. Fertilizing, which should preferably be distributed, varies from 160 units of nitrogen/ha to 220 units of nitrogen/ha depending on the variety and type of soil. 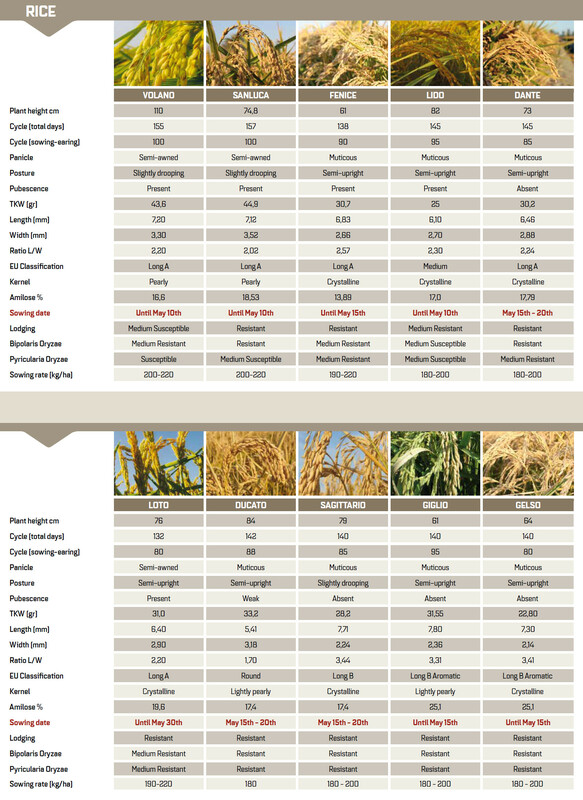 To achieve average milling yields at all times, threshing with a grain moisture content of at least 20% and product drying at average to low temperatures are recommended.